Netflix is previewing both Bright and Death Note during a Hall H panel at the San Diego Comic-Con starting at 3:15pm on Thursday, July 20. 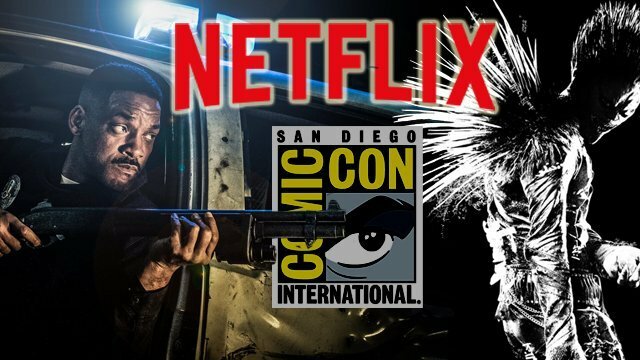 You can follow along with our Netflix Comic-Con panel live blog below! Bright is Suicide Squad director David Ayer’s next project and will be coming to Netflix in December. The film reteams Ayer with Suicide Squad star Will Smith and is also headlined by Joel Edgerton (The Gift, Exodus: Gods and Kings) and Noomi Rapace (The Girl with the Dragon Tattoo, Prometheus). Set in an alternate present-day where humans, orcs, elves and fairies have been coexisting since the beginning of time, this action-thriller directed by David Ayer (Suicide Squad, End of Watch, writer of Training Day) follows two cops from very different backgrounds. Ward, a human (Will Smith), and Jakoby, an orc (Joel Edgerton), embark on a routine night patrol that will alter the future of their world as they know it. Battling both their own personal differences as well as an onslaught of enemies, they must work together to protect a young female elf and a thought-to-be-forgotten relic, which in the wrong hands could destroy everything. Death Note stars Nat Wolff (Paper Towns, The Fault in Our Stars) as Light Turner, Margaret Qualley (The Nice Guys, The Leftovers) as Mia Sutton, Lakeith Stanfield (Straight Outta Compton, Get Out, Short Term 12) as “L,” Paul Nakauchi (Alpha and Omega) as Watari, with Shea Whigham (Agent Carter, Boardwalk Empire) as James Turner, and Willem Dafoe (The Boondock Saints, Spider-Man) as the voice of Ryuk the Shinigami. Based on the famous Japanese manga written by Tsugumi Ohba and Takeshi Obata, Death Note follows a high school student who comes across a supernatural notebook, realizing it holds within it a great power; if the owner inscribes someone’s name into it while picturing their face, he or she will die. Intoxicated with his new godlike abilities, the young man begins to kill those he deems unworthy of life. Directed by Adam Wingard (You’re Next, The Guest), Death Note will premiere globally on Netflix August 25.